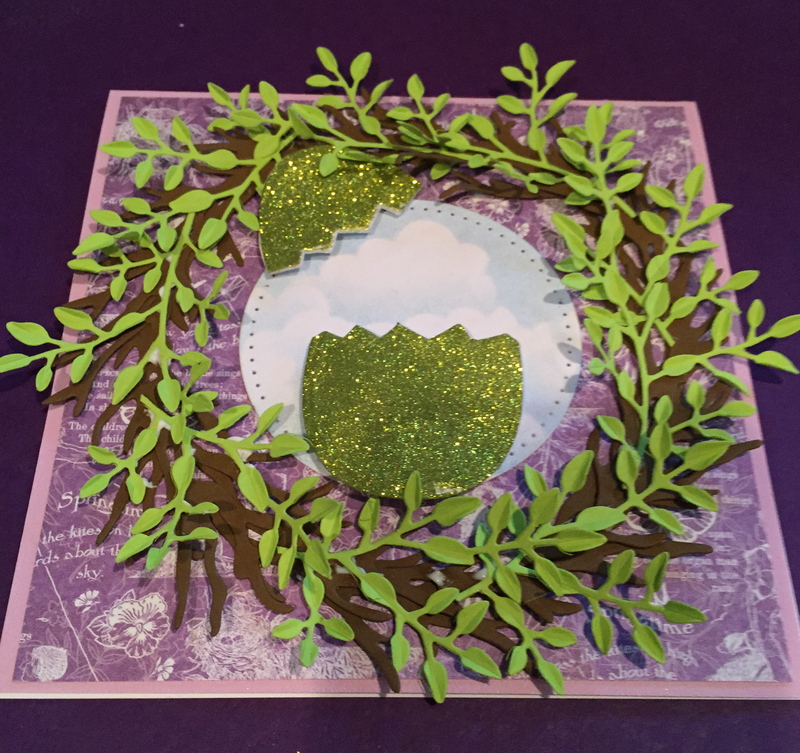 Trim the Dusky Lavender card stock to a 5 1/2-inch square card and the G45 paper to 5 1/4-inch square, then assemble with double sided tape. Die cut two of the Round Grapevine Wreath in brown card stock, two Easter eggs in white card stock, one with clear double sided adhesive on the front and back, one Stitched Circles in white card stock, six Leafy Branches in bright green card stock, four “Elm” leaves from Garden Notes Woodland Leaves, five Garden Notes Pansies (just the flower, not the stem) and leaves, two branches of Garden Notes Lilac petals in white card stock, four Lilac branches in brown card stock, and six or seven small Birch tree branches. 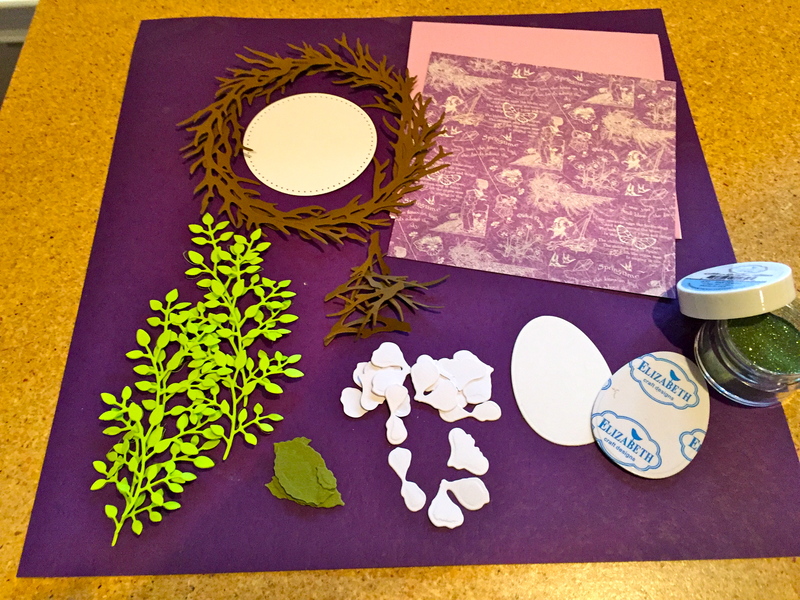 Adhere the egg pieces together, then peel off the top adhesive layer and cover with Silk Microfine Glitter (#634/Leaf Green). Use scissors to make a jagged cut about one-third of the egg. 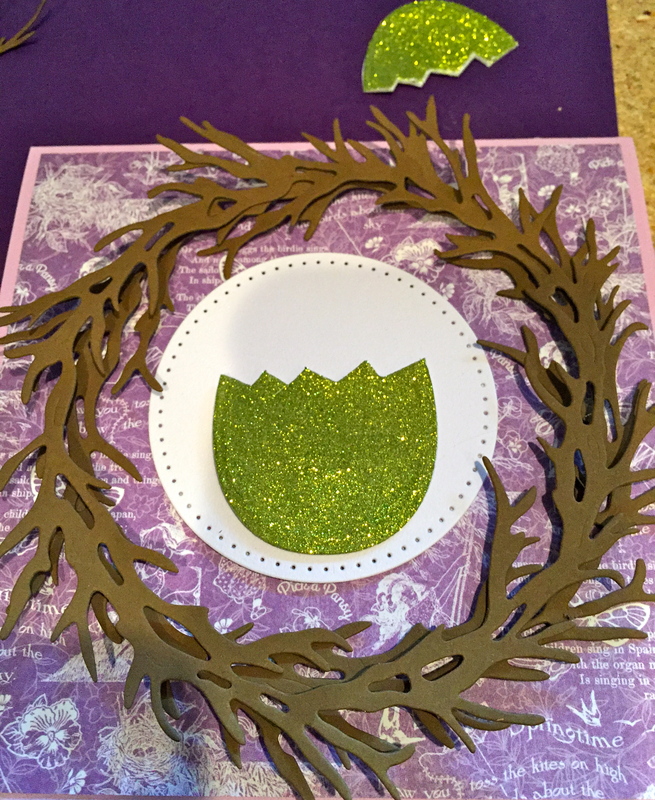 Use a small toothpick to apply a small amount of glue on the underside of each of the grapevine wreaths and adhere them, one at a time on top of each other, to the card front. Adhere the bottom half of the egg to the center of the Stitched Circle and place in the center of the grapevine wreath. 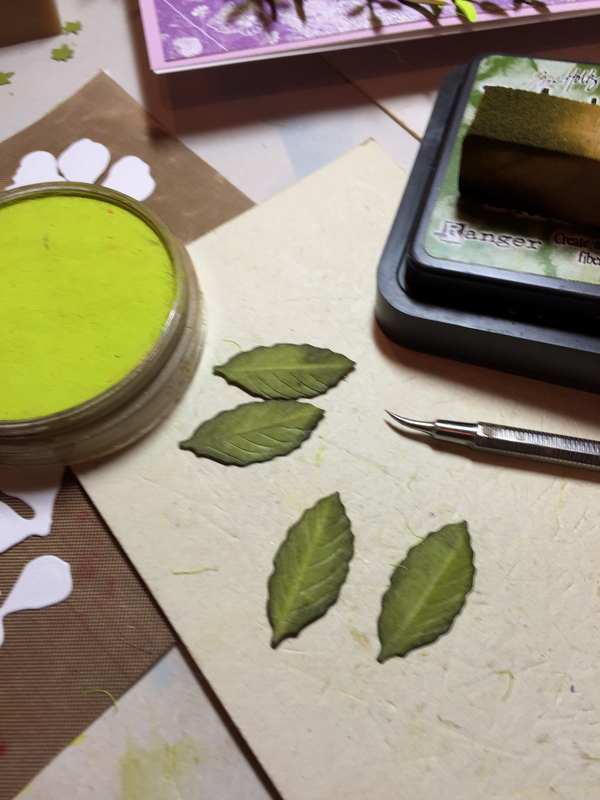 Cut the Leafy Branch in half and place the pieces on the Leaf Pad. Use the Leaf Tool to create a “stem” line and the small tweezers to bend up on this line for dimension. Use a toothpick to apply glue to the branches and place around the wreath. 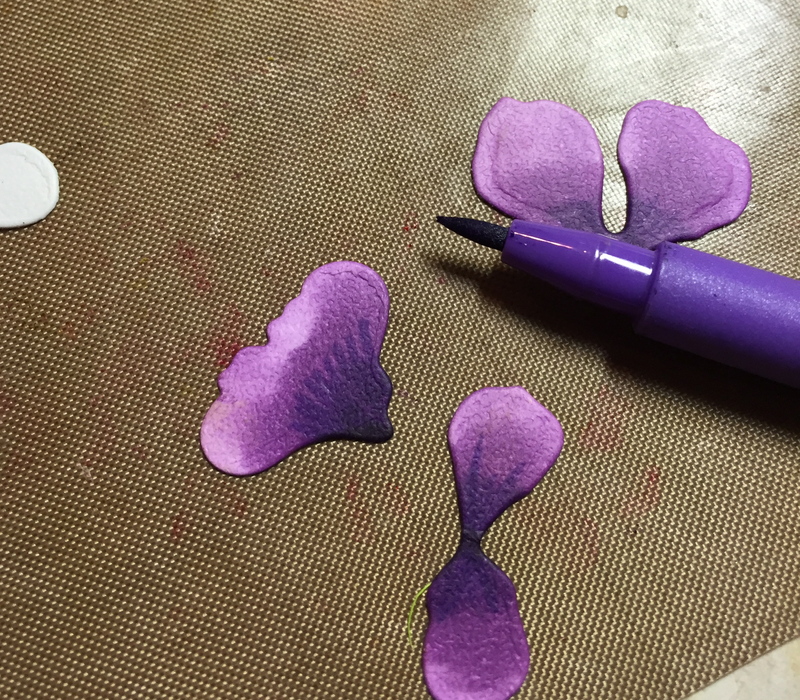 Creating beautiful Pansies. Place the three pieces of the flower, with wrong-side facing, on a non-stick sheet . Starting with Copic V15, color this side. 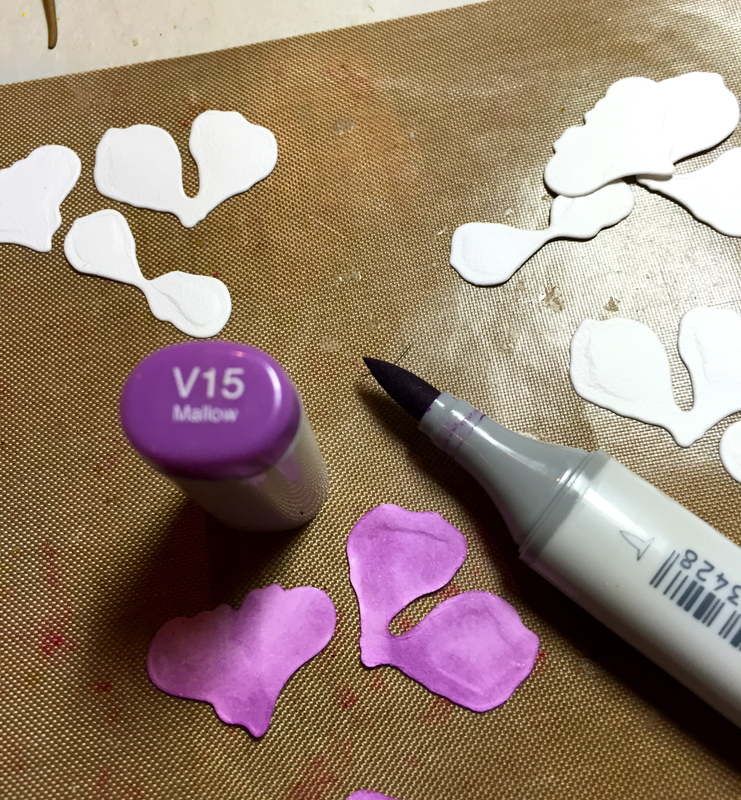 Turn pieces over and add shading to the “stem” end with Copic V09, then blend with V15. 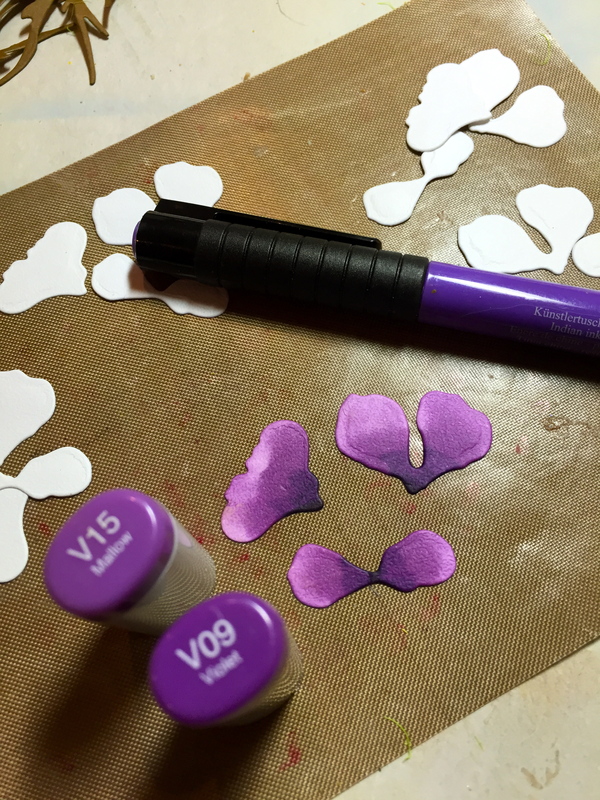 Then, using Faber Castell Pitt Artist pen in Purple Violet, I made detail lines at the stem area. Finally, using Faber Castell’s Pitt artist pen/White 101***, I add some highlights to the outer petals. 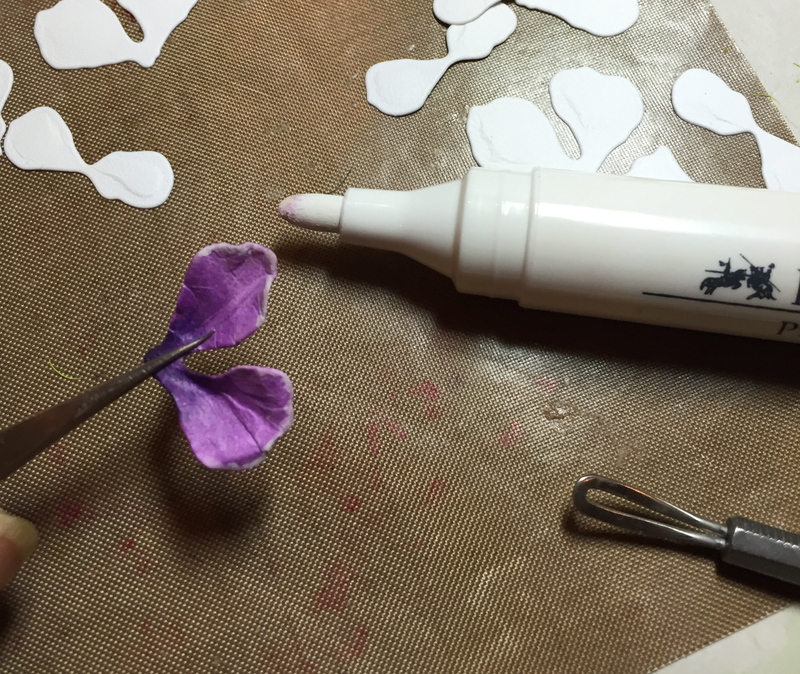 Place colored petals on the molding pad and use the small Loop Tool to shape. Assemble flowers as show in the YouTube video. Add one small Prill/Go Yellow to the center to finish. Shade the four Elm leaves with Distress Ink/Forest Green on the edges. Place leaves on the Leaf Pad, right-side-down, and add stem line. Bend up on this stem line, right-side-up, and shade with PanPastel Bright Yellow Green (Set 1). Add vein lines, pinch and bend as for all leaves. Place five Pansies into the egg, adding some of their leaves (shaded and formed as above). Create two stems of Lilacs, as directed on the YouTube video and place on the left-side of the wreath. Finally, use a toothpick to lightly coat glue onto the small Birch tree branch, dip into the Plum Crazy Prills and insert around the wreath. If you weren’t thinking Spring, this bouquet is sure to start the process! What signs are you seeing in your yard? This is a really lovely card, one of my favourites. It would take me hours to make it. Oh Susan, this is so beautiful……and hopeful for warmer weather! Me too! It’s chilly here today in spite of my daffodils up and the birds going crazy. Love all your designs. 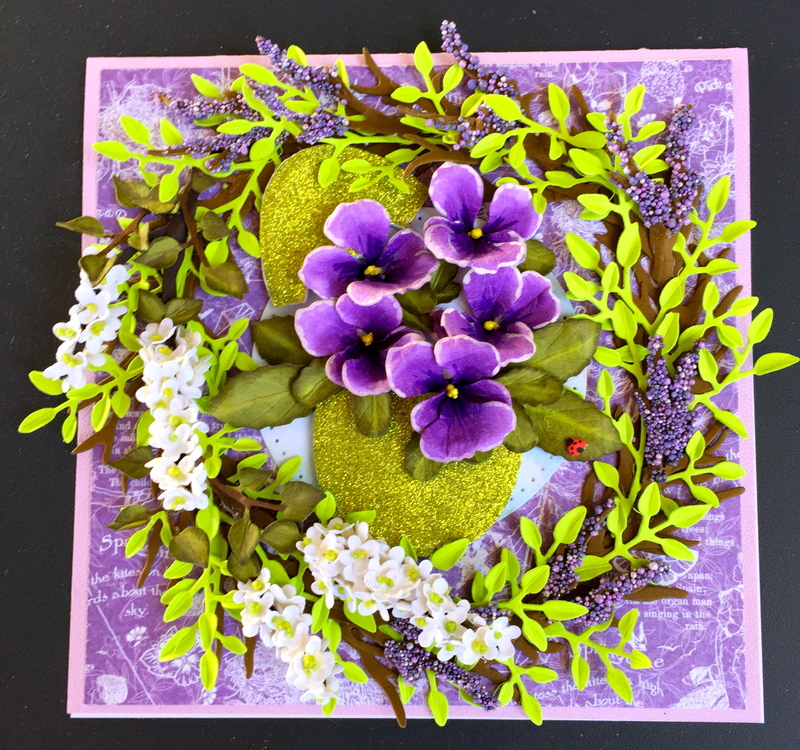 This spring card with pansies is great. I like pansies, with all the colors they come in. Thank you Shirley. Pansies were one of my mother’s favorites! Pansies are my very favorite flowers, so you know I LOVE this card. Thanks for the great tutorial. I pinned it to my Susan board. 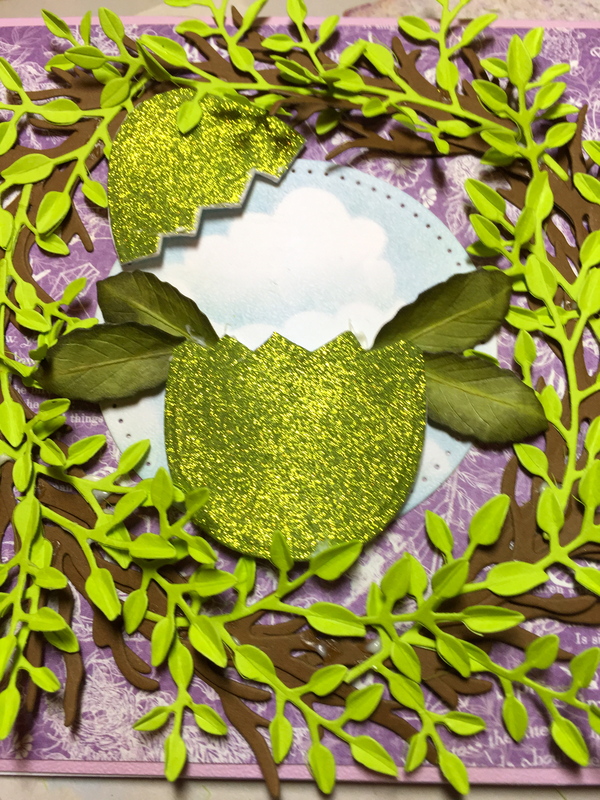 Love the eggStroidinary wreath, going to try making it for Easter,,,thank u!